HARTWICK - William Powers, 95, a life-long resident of Hinman Hollow passed away Saturday evening, July 18, 2015 at his home. Born August 10, 1919 in the original Thanksgiving Hospital in Cooperstown, he was the son of Michael and Josephine (Moore) Powers. He started school in a one-room schoolhouse in Hinman Hollow. In 1936, at the age of 16, he inherited a dairy farm from his aunt and uncle, Susie and John Cross. He graduated from Milford High School in 1938. In 1943, Bill married Doris Hughes of South Hartwick. A life-long dairy farmer and devoted husband and father, Bill was a member of St. Mary's Roman Catholic Church in Cooperstown, serving as an usher for over 20 years. Bill was active in politics, forestry, conservation, flying and music. He was Hartwick Town Supervisor for seven years, a member of the County Board of Supervisors for four years, and also served as a Town Justice. For fifteen years he worked with the Otsego County Board of Elections setting up voting machines throughout the county. He was a member of Dairylea for 50 years, a certified tree farmer, and a past chairman and director of the Forestry Practice Board for a four county area. He was also a member and past president of the Otsego County Conservation Association. He was a Charter member of the Hinman Hollow Grange which was organized in 1933. Bill served as Secretary-Treasurer for the Hartwick Town Insurance Company for forty years and president of the company for ten years. A member of the New York State International Flying Farmers Association, Bill owned and flew his own plane for twenty years. He was also well-known for seventy years as a talented fiddler and square dance caller and was a founding member of the Del-se-nango Olde Tyme Fiddlers. He played at house parties, barn dances, Grange meetings, and for twenty years played every month at the former Otsego County Meadows, continuing at The Manor. He was instrumental in the formation of the Kinney Memorial Library in Hartwick, was a member of the Hartwick Historical Society and in 1999 was named Hartwick Citizen of the Year. 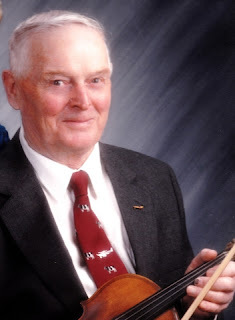 Sometimes known as the "Flying Fiddler," Bill was known to make excellent dandelion wine, enjoyed raccoon hunting, deer hunting, metal detecting and riding his ATV. A kind and generous man, Bill was always there for anyone in need and always set a great example. Bill is survived by his loving wife of 72 years, Doris; two sons, William, Jr. of Milford, and Joseph and wife, Mary, of Pleasant Valley; five daughters, Shirley Dobkins of Costa Mesa, California, Nancy Wyant of Hyattsville, Maryland, Jean Barry of Hartwick, Annette Kalinoski and husband, Tom, of Fletcher, Vermont, and Jackie Fricke and husband, John, of Northfield, Vermont; 17 grandchildren; eight great grandchildren; a sister, Susan Gladstone of West Henrietta; and many nieces and nephews. He was predeceased by two brothers, Michael and James, and two daughters, Barbara and Judy. Calling hours will be at the Connell, Dow & Deysenroth Funeral Home in Cooperstown from 4-7 p.m. on Friday, July 24, 2015. The Liturgy of Christian Burial will be offered at 10 a.m. on Saturday, July 25, 2015, at St. Mary's "Our Lady of the Lake" Roman Catholic Church in Cooperstown, with Fr. John P. Rosson, pastor, officiating. In lieu of flowers, expressions of sympathy in the form of memorial gifts may be made to the Hinman Hollow Grange, where Bill was a member for 82 years. The address is 1049 County Highway 45, Milford, NY 13807.